We learned last week that there were two fundamental responses to the arrival of the King of kings and Lord of lords. One response is by grace through faith, represented by the Magi, who were called by grace to the very feet of Jesus the Messiah, first by the natural revelation of a star, and then by the proclaimed Word of God in the presence of Herod. We saw a glimpse of the promised inclusion of Gentiles into Israel when they hear and respond to the Word, while the insider, religiously Jewish Herod stays home. Just as the Magi represent the expansiveness of God’s grace, King Herod represents the other response – the response of a person who is under the power of sin. In this case, Herod was obsessed with his own power and authority, to the point that his heart was hardened against the prophecies contained in the scriptures that he himself knew as a religious Jew. His idolatrous obsession leads to even deeper and greater sin, as we will see this week. We concluded with the question: How will it be for us? Will God choose us by His grace to live a life that proclaims His glory and might? Or will we be left in sin to live for ourselves and our own motives for our own glory? Our text this week is in three parts. Two of the parts act, in a way, as bookends for the central part. These bookends are the escape of Jesus and his family to Egypt, and their return after Herod’s death. In between these two bookends is an account of a tragedy that disturbs almost anyone who reads it – the slaughter of innocent children. 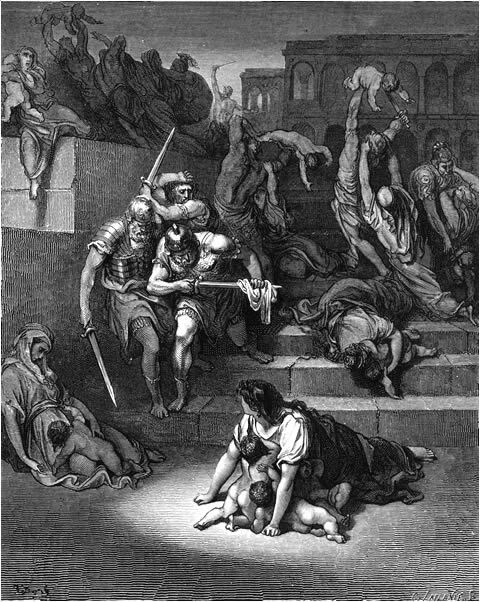 What on earth does this story about Herod’s brutality teach us? I suggest that it teaches something about our own human nature as sinners who desperately need a savior. Note again Joseph’s obedience. He does not hesitate, but picks up and heads out to Egypt at the Word of the Lord. And, just as the nation of Israel migrated from the Promised Land to Egypt for safety from famine at the time when Joseph was sold by his brothers and became their protector, Jesus will depart from the Promised Land and go to Egypt for safety. All of this was to fulfill the scriptures, something Matthew is keen to show us, specifically Hosea 11:1. We know that little Jesus will be returning. Here we see how depraved our human responses can be when we are under the power of sin. I said in an earlier sermon on this text that it is easy for us to sit here today and judge Herod for his atrocious behavior. But the uncomfortable truth about this text is what Herod says about us. Here we learn about the theological concept of original sin – the sin of our first parents into which each person in this room was born. What do we see of ourselves in Herod? We see a religious insider – a person who attends to the scriptures and who has amongst his advisors learned scholars and teachers. We also see someone with a dark heart who is keen on maintaining absolute power and control over his life and kingdom. Herod points to the fundamental defect of our hearts, original sin. Often, we try to pretend such a thing does not exist. We pretend that men and women everywhere are fundamentally good. We are, in the words of Lady Gaga, “born this way” and so if we are all “born this way” and God does not make any mistakes then we all must be fundamentally good. There is some truth to Lady Gaga’s words. We are all born in the image of God, but that good image has been badly marred and disfigured by sin. So Lady Gaga’s view of the human being leaves much to be desired. Anders Behring Breivik was born a certain way. Have you seen a picture of him? The 32-year old looks docile, professional, not at all like the kind of person who would murder 80 unarmed innocents. And yet he did, justifying his actions with a 1,500 “manifesto” rationalization of what he was doing, believing himself to be instrumental in saving his own country. How many of you have been followings the riots in the London and elsewhere in the UK? Gangs organizing themselves for the purposes of making mayhem – destroying 80-year-old family businesses, homes, cars, beating up people and stealing their belongings? What drives this? Sin. What are we to make of the gang violence that has occurred in recent days and weeks in our own county in places like Philadelphia and in nearby Wisconsin at the State Fair? In both places, innocent people were brutally attacked and beaten by groups organizing themselves via text message and Twitter? Why? For the thrill of the hunt? For the desire to acquire stuff? To be perceived as tough? Some of the perpetrators in the London riots are already being held to account. What is interesting is the number of these folks who are seemingly well-off. Many lack for nothing. One individual I read about seemed extraordinarily nervous, having been caught stealing from a store. He was ostensibly swept up by the mob moment and succumbed to the opportunity to steal. What accounts for this? Our contemporary thought leaders, therapists, and political leaders all have the tendency to say people aren’t born this way. A friend of mine recently wrote: “What incredibly bizarre times we are living in right now. I hope these growing pains (global economy, this stage of US democracy, this stage of our global technological capability) lead us to a new Renaissance at some … point! I just have to keep believing in the basic goodness of people.” You see, my friend says, these behaviors represent something aberrant in our basic good nature, something that requires therapy to fix. The biblical answer to this, one which offers a far better explanation, is that we are sinners who are daily tempted to given in in order to protect our own interests, which almost always comes at the expenses of others. I wrote in response to my friend, “The fundamental problem is that not one of us is actually good.” We are all, frankly, born like Herod. What we need is nothing less than rebirth. I read Peter’s instruction to be “sober-minded” this way: Don’t pretend, saints of the church, that because you’ve been freed from sin you cannot sin. The devil knows the truth about us, and wants nothing less than to humiliate the saints by tempting them to fall. To be sure, we are saved from God’s wrath for sin thanks to the shed blood of Christ on the cross, and we are being sanctified by the Holy Spirit. But we are not yet perfect. All of us would like to say that we’re nothing like Herod. But if we are honest with ourselves, would we not have to confess that there are many times when we harbor some of the most heinous, dark, violent, malicious thoughts and feelings against other people? How, then, can we said to be different in nature from a person like Herod? In truth, we cannot. Peter warns us not to get comfortable with perceived spiritual advancements. Be sober-minded, Peter says. Don’t forget they way you really were born. But when Herod died, behold, an angel of the Lord appeared in a dream to Joseph in Egypt,  saying, “Rise, take the child and his mother and go to the land of Israel, for those who sought the child's life are dead.”  And he rose and took the child and his mother and went to the land of Israel. But when he heard that Archelaus was reigning over Judea in place of his father Herod, he was afraid to go there, and being warned in a dream he withdrew to the district of Galilee. And he went and lived in a city called Nazareth, so that what was spoken by the prophets might be fulfilled, that he would be called a Nazarene. Why does Matthew bookend the story of Herod’s slaughter with the story about the escape and return of Jesus? What this shows us is that Jesus, like Moses, will be the one to liberate the people from slavery, and a particular form of slavery. He will liberate us from the sin that plagues all of us. The new Moses is Jesus. Matthew is shouting, through his story, to the earliest readers of this account and to you and me today, sinners and saints alike, “You need this Christ! Because of the way in which you really were born, into sin, you have only one escape – This Jesus. It is this Jesus who will lead the people to liberation into the new promised land, the kingdom of God. It is this Jesus who will, finally and forever, succeed where the first Adam failed. It is this Jesus only who will, at the cost of his body and blood, will liberate us from the captivity of our sin, including our original sin. It is this Jesus who will, by his resurrection from the dead, usher in a new reality marked by the the spiritual fruit of new birth – love, joy, peace, patience, kindness, goodness, faithfulness, gentleness, self-control (Gal 5:22-23). God’s word for us today is this: Don’t forget where you came from. We were all born as mini-Herods. Believe the good news of the gospel, that in Jesus Christ your sins are forgiven, forever. Be sober-minded. And when you are tempted, run to the Cross, the place where you were saved from the slavery into which you were born. Amen. 1New York Daily News Story here.